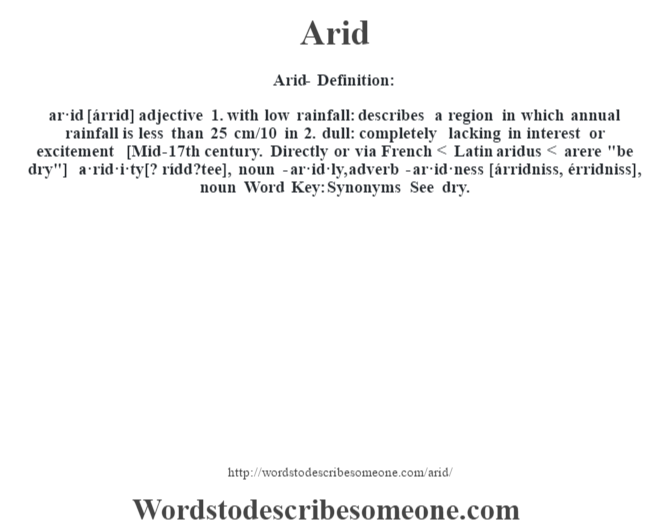 ar·id [árrid] adjective 1. with low rainfall: describes a region in which annual rainfall is less than 25 cm/10 in 2. dull: completely lacking in interest or excitement [Mid-17th century. Directly or via French < Latin aridus < arere "be dry"] -a·rid·i·ty [? rídd?tee], noun -ar·id·ly, adverb -ar·id·ness [árridniss, érridniss], noun Word Key: Synonyms See dry.